As part of my work-study summer job at the University of Redlands, I recently asked incoming and prospective students via Instagram whether they had any questions about New Student Orientation Week, life as a student, or the University of Redlands in general. Boy, did they! For those of you who weren’t able to tune in to the Instagram Q & A, here’s a look at some of the hot topics and my answers (with input from other students). Where can I find a list of items to bring with me to campus? The official list of what to bring can be found online on the U of R Residence Life and Housing web pages. What items not on the online list are commonly brought for residence hall rooms? - Band aids, Neosporin, etc. Can I bring things to hang on the wall in my room? Yes, but note you can’t poke holes in your walls, so don’t plan on hanging anything that’s too heavy. I used Command Strips (which need to be correctly removed to preserve the wall paint); dorm putty, washi tape, and painter’s tape are other alternatives. I’m nervous that I’ll overpack clothes; any tips? When you come to school in August, bring your FAVORITE clothes! If you don’t wear it at home, are you really going to wear it at school? Bring a FEW winter clothes to school in August (one jacket, a couple pairs of jeans, etc. ), but don’t bring the rest until later if possible! If you can go home for Thanksgiving break, that’s when you should bring your winter clothes back to school with you (keep in mind that Redlands is coldest in January). Thanksgiving and/or winter break is also your opportunity to take home anything you’ve realized you don’t need/use. Nope! You do you! I’ve worn pajamas to the library—no one will care. What furniture do double rooms already have? What furniture do triple rooms already have? Would you recommend bringing a bike to campus? Are there a decent number of bike racks? I know a few people who had bikes, but everything on campus is within a 10-minute (15-minute max) walking distance, so if you’d rather stretch your legs, don’t bring a bike. There’s a bike rack outside every res hall, as well as outside most of the academic buildings. There are also some in Hunsaker Plaza (outside the Commons and library, etc.). Should you decide to bring a bike, make sure to bring a u-lock for it, rather than a chain lock. People from Don’s Bicycles will be in the Plaza during check-in on the 29th if you have questions about bike care and safety. The Don’s Bicycles store is near campus and offers student discounts on bike gear! Will I be bored if I don’t bring a car? That completely depends on your lifestyle. I didn’t have a car during my first three years of college. During my freshman year, I used the shuttle to get around (for free!). The wait was frustrating at times, but at least I got where I needed to go. Later, I started tagging along whenever a friend with a car decided to go somewhere. I’m a bookworm and an introvert, so I was fine with being on campus the majority of the time. It was nice and handy having a car during my senior year, but I rarely used it during the week. Is it possible to live happily on campus without a car? Absolutely. Is it super fun being without a car? It can be frustrating, but you can make it work with the shuttle, ZipCar program, and rideshare services such as Uber and Lyft. What are residence hallway restrooms like? There are usually two hallway restrooms per floor, and each contains restroom stalls and shower stalls. Each residence hall (commonly known as a “res hall”) has at least one gender-neutral restroom, but the rest are usually marked as being for men or women (which doesn’t mean we should bully or exclude our transgender and non-binary friends!). If all the showers on your floor are in use, simply go to a different floor. Overall, don’t stress about hallway restrooms. You’ll get used to them, and everyone is in the same boat. Nope! But there are quiet hours, which you’ll learn about from your community assistant (CA) during your first hall meeting. How is the WiFi speed? Personally, I found the WiFi in the residence halls to be quite tolerable. It can get finicky at times, but overall it runs pretty smoothly. ResNet is also on hand to help make sure you connect smoothly. When are the meals in the Irvine Commons? - Breakfast: 7:00 - 9:30 a.m.
- Lunch: 10:50 a.m. - 1:30 p.m.
- Dinner: 5:00 - 7:30 p.m.
Friday evenings and weekends are a bit different, and Sunday brunch opens in the late morning. You can find the hours posted on the Commons door. Are there healthy options in the Commons/Plaza? Absolutely! The Commons has a vegan section, as well as a salad bar, and there’s always fresh fruit. The Plaza has a variety of salads and sandwiches, and other options are available in the Market. If you’re worried about healthy eating or if you’re vegetarian or vegan, don’t stress! There are plenty of options available to you. If you aren’t finding food in the Commons that fits your dietary needs, don’t be shy—ask a manager! There might be options you’ve overlooked or the staff can make something for you. Is there a community kitchen where I can use a microwave or stove if necessary? Yes! Each residence hall has a community kitchen with a stove, oven, sink, microwave, refrigerator, and storage space. Do make sure to clean up any spills and wash any dishes you use. Does laundry cost money? What do you recommend for carrying your laundry? It costs $1.25 to wash and $0.75 to dry. CARD ONLY! The system will take $8 from your account and put back what you didn’t spend after a few days. As for carrying laundry, I used a plastic laundry basket because it fit under my bed and I found it easier to carry than those colorful mesh bags (although lots of my friends had those!). Do all of the residence hall lobbies have air conditioning? Yes! Even the dorms without A/C in the rooms have air-conditioned lobbies. If you’re in a non-A/C res hall, I promise the sweating will subside after October. How often do we switch res halls and roommates? Housing selection happens every March. That’s when you can select a new roommate (or stay with your current roommate) and select a new residence hall via the housing portal on MyRedlands. Res hall selection is based on class year (rising seniors first, then rising juniors, then rising sophomores). What if I don’t like my res hall? If there’s a legitimate problem with your living situation, you can contact Residence Life and Housing or submit a Room Change Request form on the housing portal. If you simply aren’t a big fan of your res hall, just remember you aren’t stuck there forever! Where can I find more information on Orientation Week? Here’s a link to a PDF version of the 2018 Orientation booklet, which has detailed information about programming. When can we start moving in on move-in day? 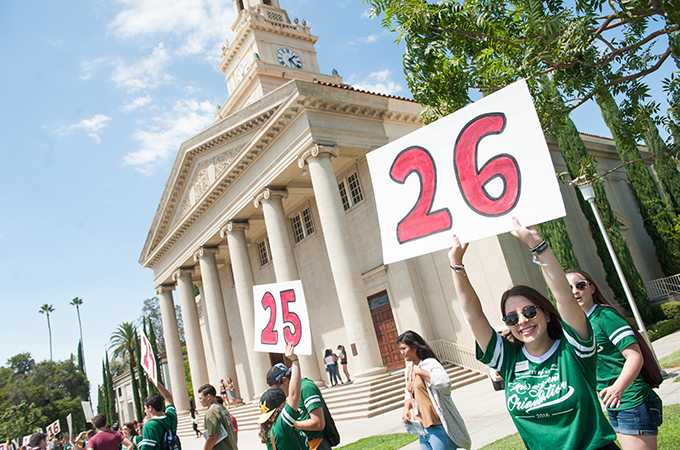 New students can start moving in between 8 a.m. and noon on Wednesday, August 29, but make sure you stop by Hunsaker Lounge to register for orientation first. When do new students sign up for classes? You’ll sign up for classes during Orientation Week on Saturday, September 1. Don’t stress—the peer advisor for your First-Year Seminar (FYS) will help you! If we’re bringing a car, when do we register it? On move-in day when you head over to Hunsaker Lounge to register for orientation, Public Safety officers will be there with a short form for you to fill out so they can give you a parking pass (bring your student ID). At this time, you can also register your bike and your laptop, in case either is ever stolen. If you miss out on this during orientation registration, you can stop by the Public Safety Office anytime to fill out the forms. Why does International Student Orientation start on Wednesday, August 22? Will we join the other new students the following Wednesday, on August 29? International students can sometimes need extra time to get used to campus. A separate orientation also lets them get more individualized attention before the rest of the new students arrive. Take this extra time as an opportunity to learn more about the groups and resources available to you on campus. And yes, you’ll join everyone else starting on Wednesday, August 29. Any tips for a smooth transition to college? How do I deal with feeling overwhelmed? One of the first people you will meet is your orientation leader—in fact, if you are an incoming student, your OL should already have emailed you! Orientation leaders are there for you—use them not just during Orientation Week, but throughout your journey at Redlands. The Counseling Center is always there for you, too. Give it a try if you need someone to talk to! Keep up good habits. Call your family/friends often. Go visit Addie! Exercise if you can. Download an app that reminds you to drink water. Remember to eat (fill your backpack with snacks). Keep your room clean (I like cleaning my room as a form of procrastination). Remember to take breaks. Talk to your friends. REMEMBER: College is what you make of it! No one is going to force you to join clubs or exercise or study—YOU have to do that! I was scared, too, especially because I’m an introvert and a first-generation college student, but making friends in college is much easier than you’d expect. Be yourself, be brave, introduce yourself to people, jump into conversations, speak up in class, try new things, go outside your comfort zone, join clubs. When you’re in your room, keep your door open. That way people living in your hallway can pop in to say hello. Better yet, leave a bucket of candy outside your door—it makes for a great conversation starter! REMEMBER: No one knows anyone! EVERYONE wants to make friends! What’s it like meeting roommates/suitemates? I haven’t been able to talk to mine at all. Try to get in touch with them via social media, especially your roommate! Meeting your roomie might be a bit weird at first, but just be friendly and open-minded. Be willing to compromise about this new space you’ll be sharing (if you got the bed by the window, let them pick which closet they want—that sort of thing). Meeting suitemates is rarely awkward; you won’t see them much anyway unless you want to. However, when you fill out your roommate/suitemate contract, definitely try to establish some boundaries regarding your shared restroom (Can I come into the restroom to do my makeup while you’re showering? Can I leave dirty dishes on the counter until they grow mold?). What if I get sick when I’m at school? A lot of students go to the on-campus Student Health Center, which is open Monday through Friday, 8:30 a.m. to 4:30 p.m., if they aren’t feeling well. The Health Center is staffed by doctors from Loma Linda University Health Center. This year, physician hours have been increased to 28 hours a week, and student government agreed students will be charged $10 per visit to help support the extended hours. Psychiatric and counseling services visits are still free. What are some of the clubs that Redlands offers? If you visit our Clubs and Organizations page, you can find an extensive list on UR Connect that includes most—but not all—of the clubs Redlands has to offer. If you don’t see one you like, you can create your own! Stay tuned for the Involvement Fair, which will happen on the evening of the first day of school and again at the beginning of the spring semester; you’ll be able to check out all the clubs and organizations available on campus. When does rushing for Greek life begin? First-year students cannot rush. As for everyone else, fall rush and spring rush start at the beginning of each semester. Be sure to check out Greek life at the Involvement Fair during the first week of school. Do we have to pay for a gym membership? Nope! The Fitness Center is free for all students to use, and we just got brand new equipment this summer. You can find the hours posted on the Fitness Center door. Are there any nearby trails to run/hike on? Yes, the Orange Blossom Trail (for runners) is right next to campus. There are a ton of places near campus to go hiking, such as Forest Falls, and, if you want to help clean the R on the mountain, you can take that hike during Homecoming Weekend. If you don’t venture off campus during the weekends, are there events/activities to attend? It depends on the weekend, but there never seems to be a lack of things to do! - There’s an outdoor concert at the Plaza on the third Thursday of every month. - There’s always someone cool coming to campus to give a talk (past speakers include Mario Lopez, Laverne Cox, Jane Goodall, Maya Angelou, and more). - There are tons of School of Music performances. - The theatre and improv troupes have several shows every year, and you should definitely go to Dance Company’s showcase at the end of every semester. - There are always events surrounding holidays of multiple cultures. - There is also a large number of community service opportunities; visit the Community Service Learning (CSL) Office’s page. If you are able to go home on the weekends, challenge yourself to stay on campus and check out the weekend scene for at least the first month. This way, when you stay on campus later in the year, you’ll already know what to expect. Keep an eye out for event advertisements in Hunsaker Plaza and on the televisions in the Commons. There are over 200 events/activities every year—you definitely won’t be bored! Are there any karaoke events? Brace yourself for Greek life’s Lip Sync. Chill places to study throughout campus? Are there any good coffee shops close to campus to study and relax in? ~ My other favorite is the one on Redlands Blvd. because it has a drive-thru and it has more seating space than the one on Orange St.
Any study spots open late on and off campus? - Armacost Library and Hunsaker Lounge stay open until midnight. The bottom floor of the library stays open longer. - Your res hall lobby won’t always be the best place to study (especially in East, Williams, and Anderson), but things usually quiet down after 10 p.m. or so, which is great for night owls. How does May Term work? Is it optional? You get two free May Terms. Whether or not you use them is completely up to you. I only used one of my May Terms, and I did it so that I could get that one last liberal arts requirement out of the way without having to take it for a whole semester. Our May Terms are pretty fun and unusual, so be sure to stay on the lookout for them when you register for your spring classes later this year. You can also study abroad during May Term! Do Johnston students have any liberal arts requirements? Students in the Johnston Center for Integrative Studies need breadth, depth, and a cross-cultural experience. Through a contracting process in sophomore year, each student, in a conversation with a committee of Johnston faculty and students, determines what they need to do in order to graduate. So, essentially, no. You take several courses in different areas (breadth), you focus in on a couple you like (depth), and you get out of your comfort zone (cross-cultural). When does study abroad take place? Where can you go? Don’t be afraid to ask your orientation leaders and peer advisors questions! Housing-related questions can be directed to RLH@redlands.edu and other information is available on the Student Affairs website. A new University of Redlands app will also provide student-focused resources.